As I sit in traffic on the way home these days, tummy rumbling and my concentration drifting into thinking about what to eat for dinner, all I ever dream of is some kind of warm stew or soup with a chunk of bread or a generous serving of potatoes. Quite frankly, nothing else will do. This stew is flavoursome, nutrition packed, filling and exciting with it’s range of textures. 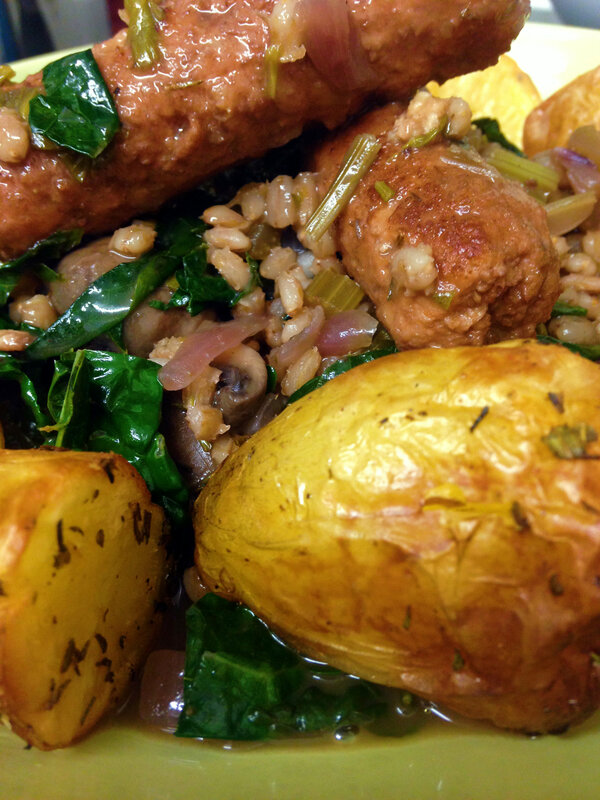 In each mouthful you get hearty sausage, earthy mushroom and chewy barley in a rich gravy. Made even more satisfying served with crisp roast potatoes, this stew will keep you cozy through to next Spring. Now, one thing I have learnt over the many years of vegetarianism, is that no two veggie sausages are the same and what one loves, another will hate! So, use any sausages you prefer, they vary worldwide anyway. Even make your own if you can wait that long! Add the sausages to a large non stick pan and fry (you can add a little oil if you wish), turning every now and then, until browned all over. Remove the sausages from the pan to a plate and set aside. Gently fry the onion and celery in the same pan for 5 minutes until softened. Add the mushrooms and saute until starting to turn golden. Stir in the barley then add the herbs, wine and stock. Season well with salt and pepper. Simmer for 15 minutes, then return the sausages to the pan and simmer for a further 20 minutes until the gravy has thickened. Add the chopped kale and Worcestershire sauce and simmer for another 5 minutes, until the kale has wilted. Serve with roast potatoes or chunky bread. 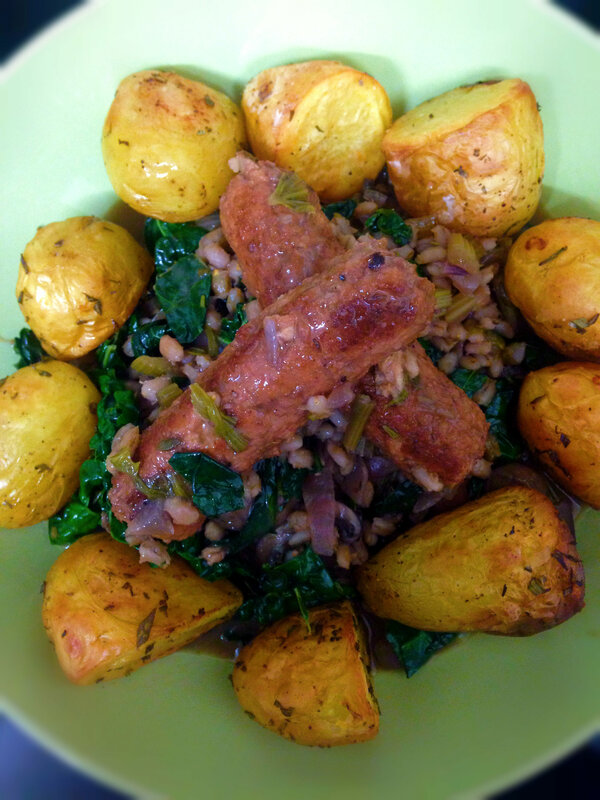 This entry was posted in Egg-free, Mains, vegan, Vegetarian and tagged autumn, Barley, dairy free, egg-free, fat free, food, healthy, kale, recipe, stew, vegan, vegetarian. Bookmark the permalink. Mmmmh that sounds delicious!!! Must try this. 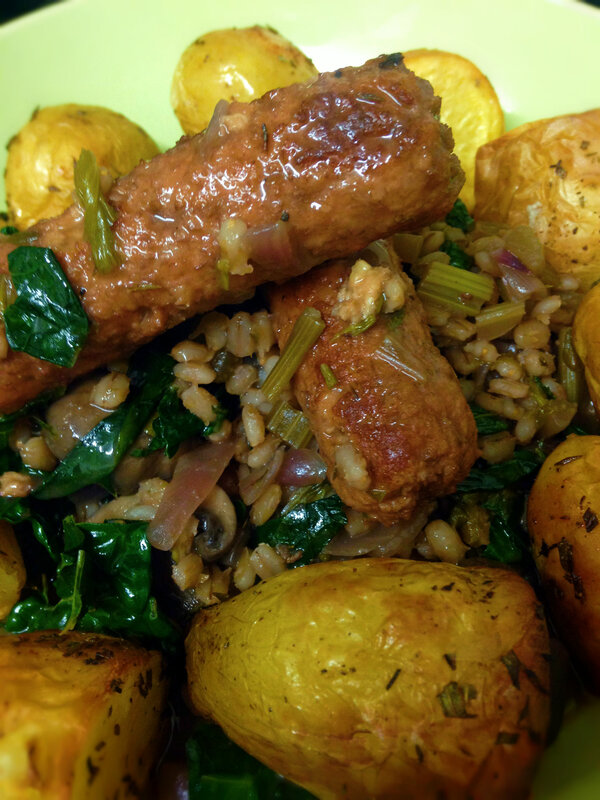 I’ll be using Dee’s Vegan Sausages (not sure you get them in the UK yet? She’s won an award for them! SO GOOD!!!! dees.ie if you wanna look them up) Thanks for the recipe!! Ah yes, I tried Dee’s sausages at a food show this summer but they’re not available here yet! 😦 Hopefully soon! I’m sure they’ll be wonderful in this stew! Hi Deena! I just found your message in spam! Interesting – I’ve been despairing at my inability to find decent vegan sausages for casseroles, convinced that Linda McCartney ones would disintergrate in my slow cooker – is this not so? How exciting! The pictures you got of that dish are unreal! Stew are the best comfort foods, and crispy roasted potatoes are my favorite components in any savory dishes! Yay for Linda McCartney’s sausages! I love them since I was living in the UK for awhile, and had their pies, too! This looks great! I used to buy homemade vegan sausages on eBay from a girl in Portugal, she mailed them all the way to the US in just a plain envelope. Somehow they always survived, and they were wonderful. Maybe I’ll have to try making my own since she no longer sells them. 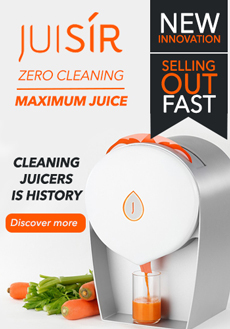 Wow that’s incredible! I didn’t even know you were able to buy/sell food on eBay! Veggie Sausage Stew! Looks delicious. 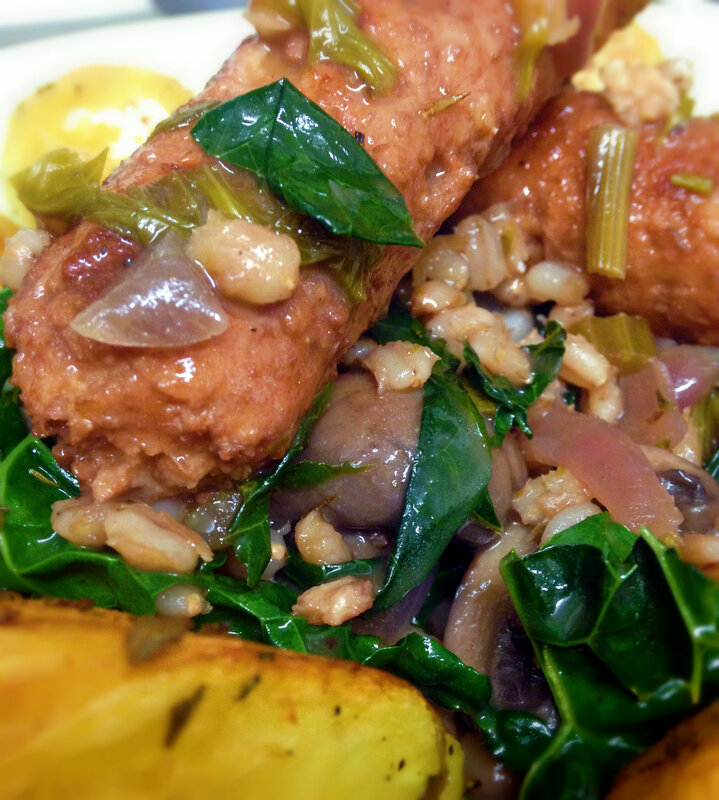 I’m a big barley fan especially- So chewy and hearty, perfect for wintery dishes. Sounds absolutely delicious! I know this is heretical, but it could be done with a meat sausage as well. Changes the nutrition profile, of course, but carnivores love barley and kale, too. Forgive me! Of course, any sausage can be used but as a vegan blogger I can’t suggest a pork banger in the ingredients list! What a hearty, comforting dish. I have to say, my favourite thing in the world is probably potatoes, and boy, do these look incredible! Love this dish. I’m totally with you on potatoes!! Poppy this looks fab! Is the sausage from that Kinda mcCartney?? Yes the sausage used is Linda McCartney. You can use any you like though! oops meant Linda– Paul’s wife? This sounds very very tasty! Yum! I’m coming to London in a few weeks. I want to smuggle LInda McCartney sausage back here to the U.S.!! Ice packs? How? I don’t know. I’ve not found good ones here yet. I’ll try harder. This recipe makes my mouth water! Well done. Hi Susan! How exciting your coming to London! My husband loves sausage!! This looks great Poppy – I’ll have to make it for my hubby! 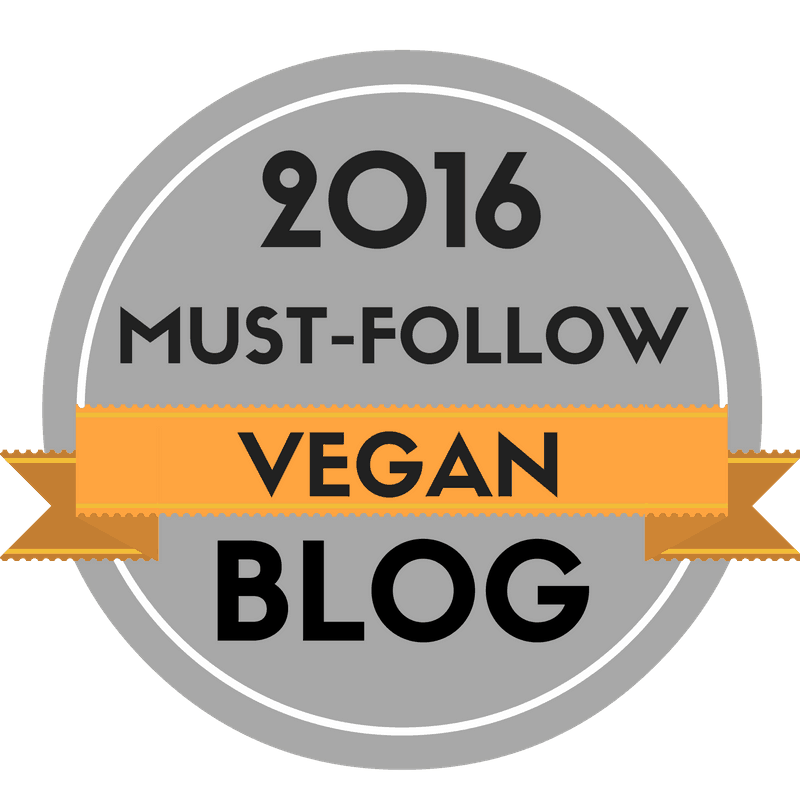 Celeste “The Honking Vegan” – honk, honk! Looks so great. I love kale! I make a yummy sausage and kale soup! Great recipe. Thanks for posting it. That sounds perfect for a cold day. I’ve always wanted to try the Linda McCartney sausages but until we can get them here, I’ll stick to Field Roast. And vice versa I’d love to try Field Roast! One day! This does look very tasty and comforting. Hi Ally, I just found this message in spam! Thank you very much. It is a dish that is good for the soul! We had this for dinner tonight and it was wonderful! Thanks for sharing your recipe! Yes please! I can’t wait!